When Sir Dave Brailsford revealed Team Sky's fuelling strategy as the secret behind Chris Froome's remarkable solo breakaway on stage 19 of this year's Giro d'Italia, it may have seemed to the sceptics a laughably transparent attempt at misdirection. But whether you're a top pro cyclist like Froome or an amateur riding a sportive, the reality is that eating and drinking properly is key to finishing an endurance effort. We can't all have a support team lining the route of every ride; as a sportive cyclist, your fueling strategy will mean making the most of the feed stations the organisers have set up at key points along the route. But it's always a good idea to bring along some food of your own too, whether that's energy bars or bananas. 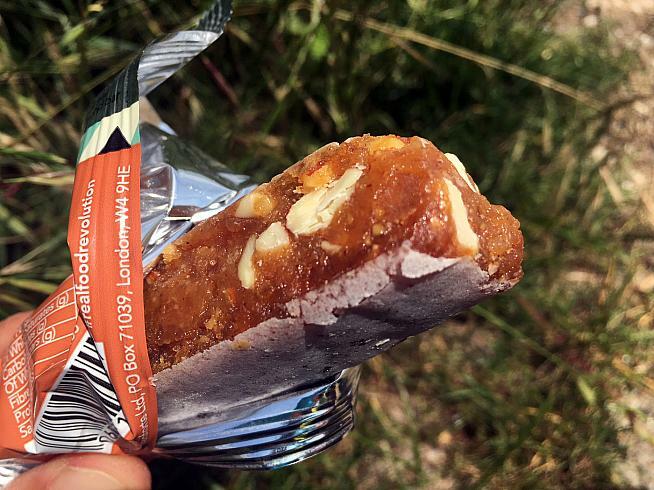 Recently we've had the chance to try out the latest energy bars from Veloforte. Veloforte bars use natural ingredients and they actually taste great too. 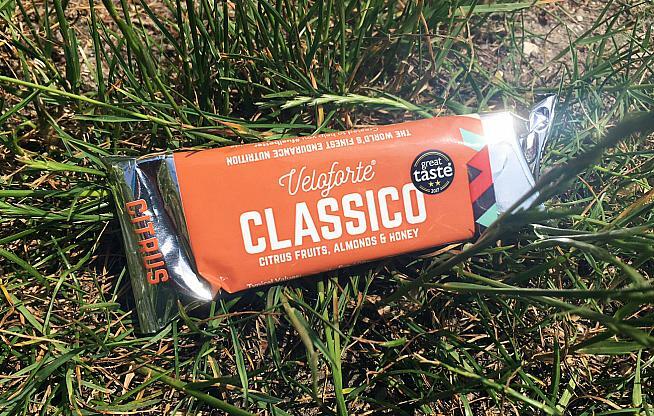 Veloforte bars are 100% natural, which is good news if you find your stomach struggles to cope with the rendered down, synthetic composition of more highly processed energy products. The bars are free from gluten, dairy, egg or any additives and perservatives, and being easily digestible, they should be suitable for just about anyone except people with nut allergies. They're available in a growing range of flavours. The Classico we tried was a surprisingly tasty mix of citrus fruits, chunky almond pieces and spices reminiscent of a continental Christmas treat. Candied fruit peel adds a pleasant zing, while the dense texture is satisfyingly chewy without being heavy or gluey. The bar is backed with a thin layer of what looks like rice paper, the sort you might find on turon. It's actually a wafer paper (made of potato starch rather than rice, I think), but either way it adds a welcome savoury, dry contrast that helps balance the sweet, juicy fruit. In fact it's so good I'd happily snack on these off the bike; not something you can say about most sports energy products. On the recent Wiggle Sussex Granfondo I overheard another cyclist telling his ride mates about Veloforte, so the word is clearly getting around. When they taste this good, it's no surprise. I'm looking forward to trying the other flavours. Candied fruit peel and chunks of almond make for a winning combination in the Classico. 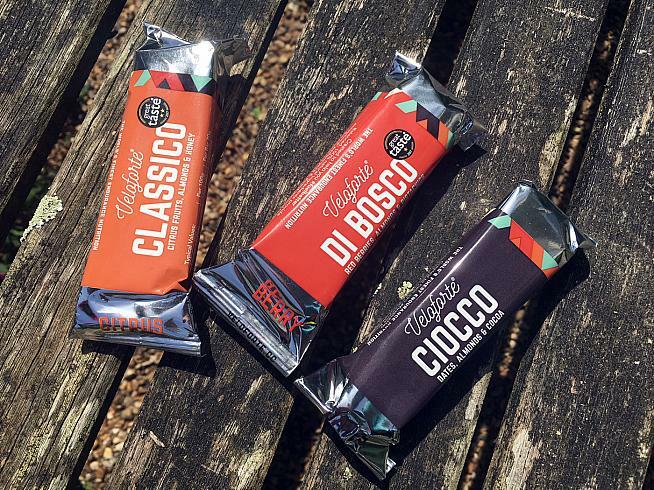 Flavour aside, Veloforte have squeezed a healthy dose of energy into each bar too. The Classico has 1237 kj / 294 kcal per 70g bar, which doesn't mean a lot to me but I've just compared it against the wrapper of a leading brand energy gel I had on my desk. Perhaps surprisingly, the Veloforte bar packs in three times as much energy as the 60g gel (367 kj / 86 kcal). It all stacks up to a compelling, not to mention delicious, offer. If you've had it up to here with scientifically formulated gels and fancy fuelling your ride with some "real food", you may well find that Veloforte hits the mark. Just beware, those beautifully wrapped little bars are dangerously tempting - best store them out of sight, or you'll have none left by the time your next sportive rolls around.